… corn-free, cauliflower-free, refined sugar-free, almond-free… & I’ve been mammal-free for over a year now. Let me guess: you are currently reading this thinking, “what the heck is there left to eat? !” I asked the very same thing. I’ve always considered myself to be *fairly* healthy. I workout 4-5 times a week. My diet is typically fairly low-carb & low-sugar, but I don’t restrict myself so much that I obsess. Anyone who knows me knows this to be true: there is little else that I love more in life than pizza. So I’d say I practice “balance,” as it relates to my food consumption. Granted, I’m super into health, fitness & wellness. I’m always reading up on the latest diet & fitness trends, & I am pretty dang committed to living my healthy lifestyle. But when I noticed that I seemed to be sluggish all the time, no matter how much sleep I got… & the fact that, in the 2ish years since getting married, I’ve managed to gain 25 pounds with no absolutely no change to my diet or lifestyle & I find the weight to be impossible to get off… I started asking questions, which led me to the food intolerance test, which resulted in me changing up my diet quite significantly. The motivation is real. It’s so much easier to fully commit to a major change in diet when I have the same commitment from Hubs! The first step of this process: dispose of absolutely everything we cannot eat from the refrigerator & pantry, so temptation can literally not exist. So here we go… off to New Pioneer Coop! & HyVee! & Trader Joe’s! Two garbage bags full of food. I hate waste. Definitely going to find someplace to donate this stuff. Also, deep cleaning the fridge & reorganizing the pantry is oddly therapeutic. Surprisingly, this isn’t that difficult to stick to. I feel like we’ve settled into our mindset, promising each other that we’d give this a solid effort for 90 days, & then see how we feel about things. We’re both freaking exhausted. & I thought I was tired before! By 2-3pm, I need a nap. Like, I literally can’t make it through the rest of the day without one! I love naps. 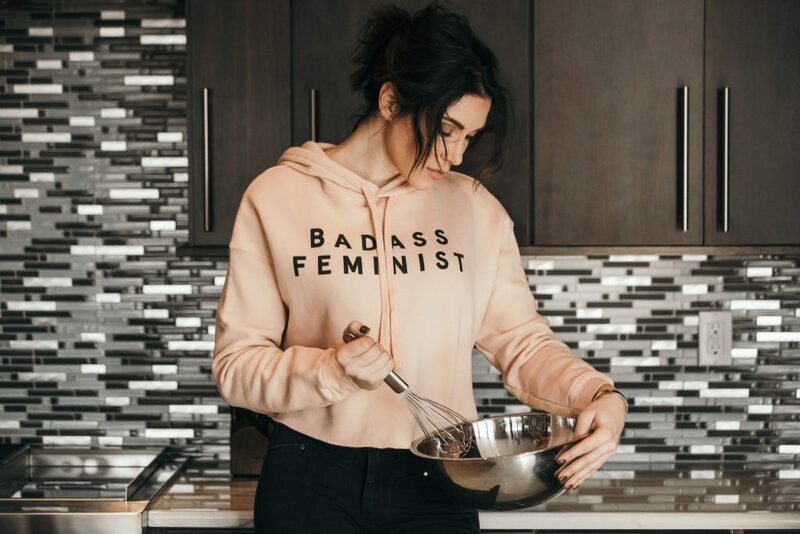 My biggest struggle so far: what the heck do I eat for breakfast, if I can’t eat eggs?! I haven’t figured it out yet… so, I’m finding that I’m skipping it. I love breakfast so this isn’t exactly sustainable, but as I get settled into a completely new diet I won’t worry about it too much. 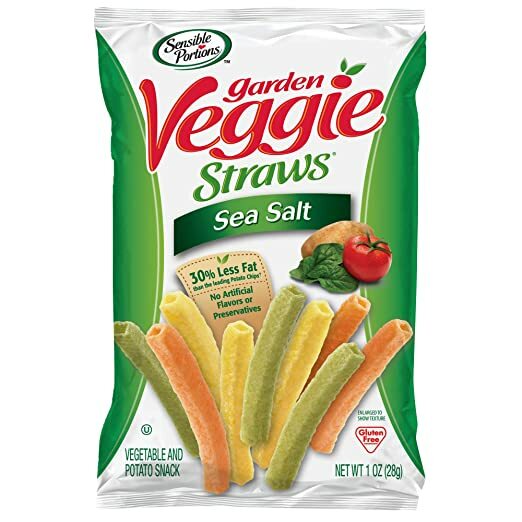 Veggie Straws & my Vital Proteins Collagen Coffee Creamer. OMG, my skin is freaking out. I swear, I haven’t struggled with breakouts like this… ever. Not even high school. It’s like by body is purging anything bad in my system, & pushing it out through the pores on my face. It’s disgusting & I’m super self conscious. My Summer Fridays Jet Lag mask is my best friend right now, & I’m going makeup free so my skin can breathe. I’m kind of struggling with stocking the house with easy grab-&-go snacks. I often leave the house in the morning (sans breakfast!) & am on-the-go until I come home in the evening, so it would be nice to have something to through in my purse to carry me through the day. When I have time, I’m finding lunch to be easy. & local, which I love! Brewhemia + their mediterranean salad & Rawlicious + just about anything on their menu have me covered & keep me fueled up & full. 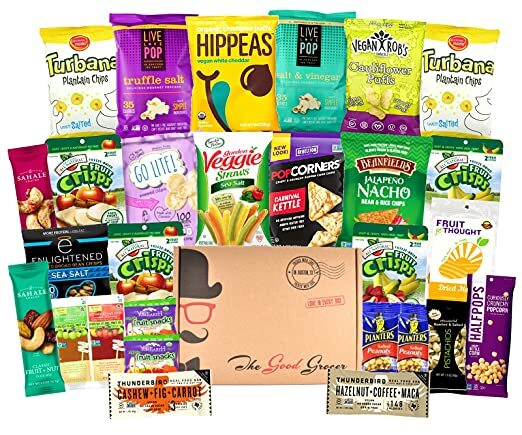 In the meantime, I’ve ordered a gluten-free & vegan healthy snacks care package from Amazon. I figure this will give us the opportunity to find a few snacks we like, & can then stock the pantry with them. So, the key to making this new diet/lifestyle work is the fact that my Husband is a rockstar. We have this amazing arrangement: during the day, I find the recipe to something that fits our diet & looks good for dinner… after work, he swings by the store & snags all of the ingredients. 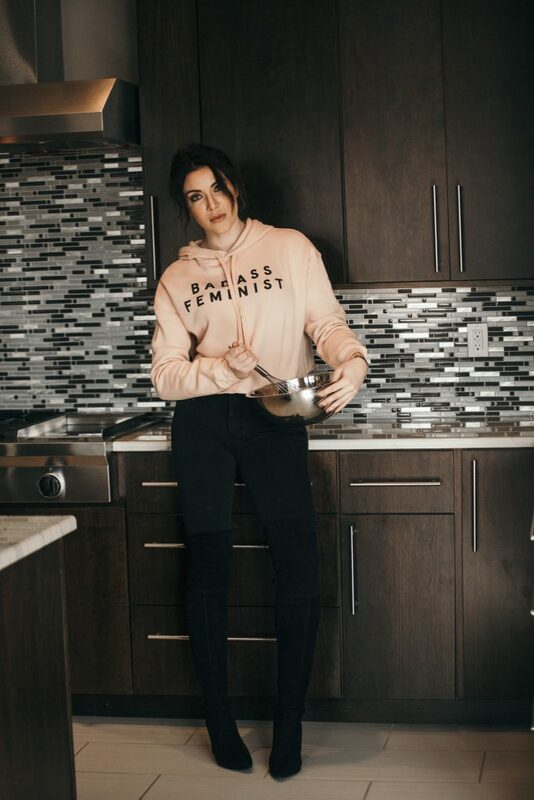 He enjoys cooking, so I let him have at it in the kitchen, while I have the luxury of getting *just a bit* more work done. 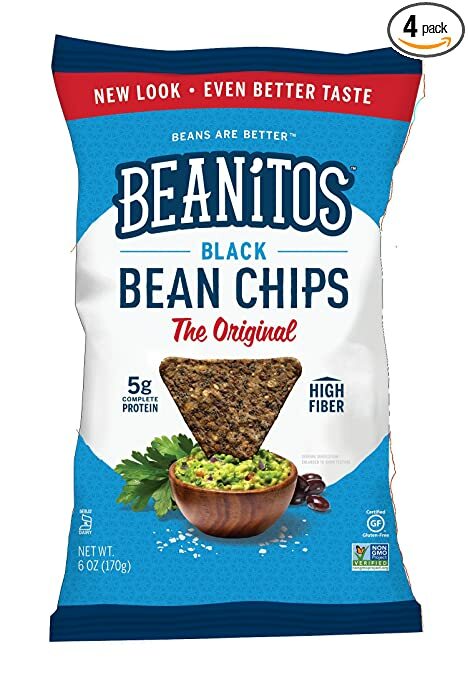 I have a go-to snack: Black Bean Chips & Oasis Hummus. 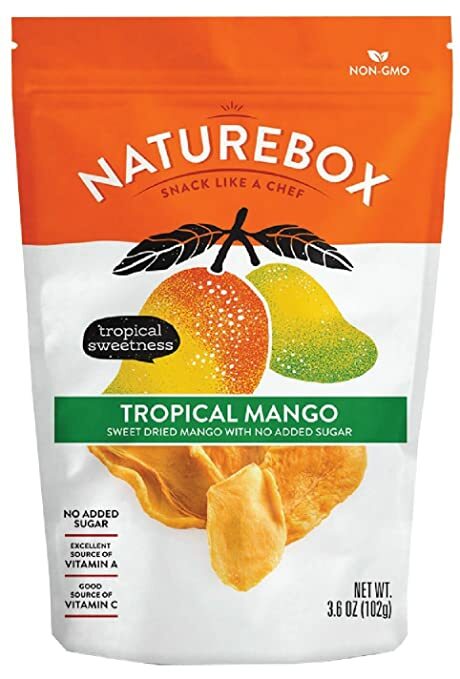 & when I’m craving something on the sweeter side, I turn to dried mango. The only problem? The gas is real. Thank God D. is out of town this week… I have him convinced that I’m a unicorn that doesn’t pass gas. What’s on tap for dinners this week? 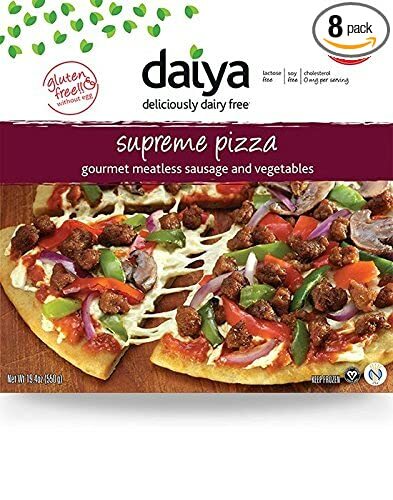 Believe it or not, I found a gluten-free, dairy-free, cauliflower-free, meat-free frozen pizza by Daiya. I am *slightly* concerned about what the heck is in the pizza… but, a girl’s gotta feed herself. Pho is gluten-free! This is legit the best. news. ever. We ordered takeout twice this week from Phong Lan’s, & it’s making my life. Warm, comforting, delicious. I order 1/2 the noodles & double the veggies, with tofu. 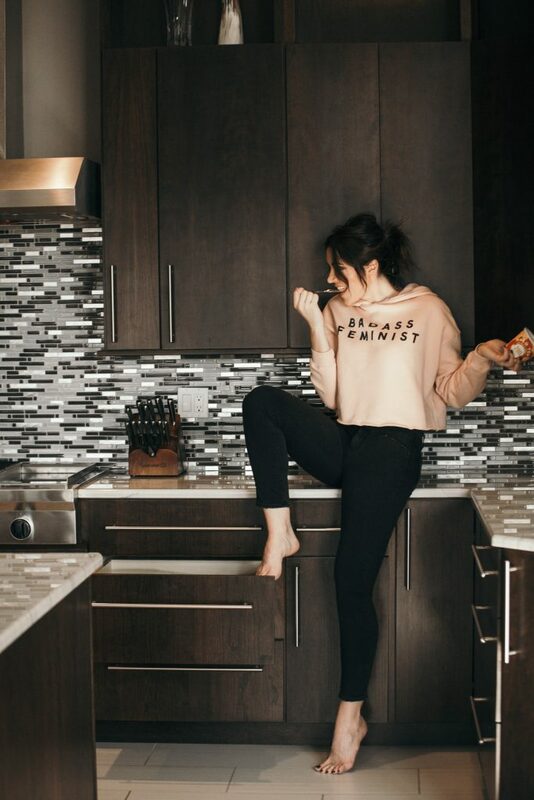 I know, I know… soy isn’t great. But, I’m finding that I’m not taking in much for protein. I jumped on the scale at the gym this week, & it hasn’t budged a single pound. Not cool. I’m not doing this exclusively to loose weight… but, if I’m going to give up things that I love so much (skim milk & pizza!) then it would be reassuring to see the number drop a little. Goals for this week: protein shakes for breakfast! The gas is still real… &, at times, really painful. I’m assuming it’s all the veggies I’ve been eating & my body still detoxing all the bad stuff. Added Beano to my grocery list this week, nonetheless. I cheated. We had a jam-packed weekend, hosting friends from out of town & celebrating Hubs birthday. I was over served on Friday night & come Saturday mid-morning, I decided that the only thing that could possibly cure me was grease. In the form of pizza, while we watched college football all day. Big mistake. Honestly, it didn’t even taste that good. I feel guilty that I had been so careful & so diligent for almost 6 weeks, that I couldn’t enjoy the two pieces I allowed myself. & there was hell to pay later. Seriously, I wanted to die. I’ve been struggling with gas for the last couple of weeks… but it didn’t even compare to what I suffered from after cheating! No gluten & no dairy for almost 6 weeks… my body flat-out didn’t now what to do with what I put in it. I found myself crippled with trapped gas & bloating… & the worst of it occurred while we were attending a charity gala! I was afraid to cross my legs, because my insides felt so swollen I was certain something would come out from somewhere. I was experiencing stabbing pain to a level of discomfort that I actually considered going to the emergency room & having my stomach pumped. That sounded like it would feel good, in comparison. I struggled through, without an ER trip… but I swear, pizza is forever ruined for me. I will not cheat again. So here we are, a full 6 weeks into our 90-day commitment to gluten-free, dairy-free, egg-free & mammal-free. Honestly, I’m not sure I feel that much different… which has me looking into what else could explain my lack of energy & weight gain. After 6 committed weeks, I still have not dropped a single pound. I’m still struggling with gas, & I love an afternoon nap. Could it be my thyroid? I’ve struggled with regulating it off & on my entire life, so this is definitely possible. Things I have noticed: despite the breakout that happened early on… my skin has seriously never been better. Admittedly, I have had a hydrafacial in this time but: my pores look smaller, I feel less oily, & I haven’t had a single blemish for a solid month. Also, I feel like I’m mentally sharper. While I’m lacking energy still… the hours I am committing to getting things done are super productive. I feel like my thoughts are clearer & I’m generating new ideas like a #girlboss. Crazy good skin, creative juices are flowing, & I’m checking off my to-do list at warp speeds? I’ll take it. What about you: do you have food intolerances &/or dietary restrictions? Have you gone gluten-free, dairy-free, egg-free & mammal-free? How do you feel? How can I expect to feel over the next 6 weeks of clean eating? Don’t forget to download the LIKEtoKNOW.it app & follow me (signedM.eegan) to shop all of my looks!